Discussion in 'Trek Tech' started by CuttingEdge100, Sep 18, 2014. I just tend to keep the general pattern of the Shane Johnson style rooms for officers and uadd bunks for enlisted (so four per bathroom). Though one wonders about what we saw in Flaskbacks with Excelsior having bunks for officers. It may have a much larger crew than Enterprise, or thay are using wartime crew compliments while stationed that close to Klingon space. Though one wonders about what we saw in Flaskbacks with Excelsior having bunks for officers. So, possibly a random conveniently located crew facility (Tuvok calls it "crew quarters") where junior bridge officers can have a bit of shut-eye or whatever during long alerts when they aren't allowed to go all the way back to their cabins but aren't required at their consoles or other stations, either. The ship was on a prolonged alert, and Tuvok was part of a Gamma Shift that was allowed rest during that alert. We don't have to assume that this was the same room as the more appropriate-looking set where Tuvok interacted with Rand. That facility was down on Deck 7, as per the corridor sign, but the bunk beds might have been right below the Bridge and used for that reason. That Valtane was stated to be Tuvok's bunk-mate need not be a permanent situation: it may have applied to that one brief nap in those crew quarters exclusively. In the Movie Star Trek: The Undiscovered Country. Captain Sulu was sleeping on the bottom bunk, when the character play by Christian Slater step in and gave him the time arrival report to Khitomer. Huh? I'm not seeing any top bunk anywhere. Even if they used the three-high bunks from elsewhere in the movie for this shot, they hid it well. I take it back, my mistake. I went and look at the scene. Cause of the close up scene. We can't tell if Captain Sulu is sleeping on a bunk bed or a bed built into a nook. Also he wasn't reporting the arrival time to Khitomer. But was actually reporting that Star Fleet wanted to know the where about of the Enterprise. The sign behind Christian Slater character read deck 3. If it was his original cabin that he shared with another Ensign (with the second bed just off camera) then it does raise the question of why there is only one cylinder wardrobe and no additional storage facilities - or do they share EVERYTHING when they share - hot-uniforming maybe? I'd argue we just missed the door connecting the two mirrored cabins at the wall opposite the wardrobe (the set does have a door that goes nowhere on that wall). There could be a Shane Johnson -style bathroom between the cabins, or then not; corridor showers might be standard for juniors. While that door could lead to a shared bathroom (AKA Franz Joseph officer quarters) it would still mean a huge amount of space for standard Ensign/crew accommodation, and that's not quite what I meant. As for bathrooms, there's very little evidence in TOS that any of the cabins had ensuite facilities. In a deleted scene from Corbomite, we see Rand using that little door on the side and it appears to be a walk-in closet, complete with recessed shelving. In Amok Time (and many other 2nd/3rd season episodes) the two doors to the cabin set have a little corridor running down the side of them, which totally precludes the presence of an ensuite bathroom or even a walk-in closet! And yes, that side door is still seen on the inside of Spock's cabin. It could be a smaller closet, I suppose. Otherwise, it must be interpreted as a THIRD exit to the cabin. This may well be what we are seeing in By Any Other Name when Rojan walks in on Kirk "apologising" to Kelinda. The only person we see who may have a bathroom is Uhura, and that's only because Elaan locks herself inside it! It may of course have been just another walk-in closet, but I have to think that Uhura's quarter's had some distinguishing feature to them, otherwise why not just stick the Dohlman in standard guest accommodation? Could be a closet type room on one end with a toilet/sink/shower on the other end. Could be, and I'm perfectly willing to accept that different cabins had different rooms through the side door. Also worth noting is that Elaan's room seems to be a lot deeper than the one Rand uses. In conclusion, I think it has to be either a walk-in closet or a bathroom; there doesn't seem to be room for both. 1: In "Mirror, Mirror", the "empire" Marlena leaves Kirk and walks through a sliding doorway into an adjacent room that contains a table. While the I.S.S. Enterprise is obviously not a Federation starship, the configuration is unmistakably familiar. Could the captain's quarters in either the "prime" or "mirror" universes be considered at least very similar, for reference purposes, and could this adjoining room combine a wardrobe, head, and other command-grade officers' premium facilities? 2: Identifying Ensign Garrovick as the "new security officer" in "Obsession" need not necessarily make him the Security chief (that role previously belonged to Commander Giotto), but Garrovick could easily be one of Giotto's most important aides. Garrovick operated a tricorder on the surface of Argus X, while other security personnel accompanying Captain Kirk to the surface in search of the "cloud creature" did not; this suggests, however loosely, that Ens. Garrovick may have been Giotto's new forensic specialist, or the senior officer assigned to Giotto's forensic unit. It should also be noted that when Nurse Chapel visits Garrovick's quarters with a tray of food, the shadows behind her betray a pass-through like that of Kirk's, Spock's and McCoy's quarters. So, either Garrovick is a special-case junior officer with command-track duties, following in the footsteps of his father (and privileged quarters to match), or the other unseen "section" of his quarters beyond the pass-through contains another bed for Garrovick's roommate. That having been said, I have a new question: Has anyone tried to nail down the size of the Vanguard-style space station seen in the "remastered" version of "The Ultimate Computer"? 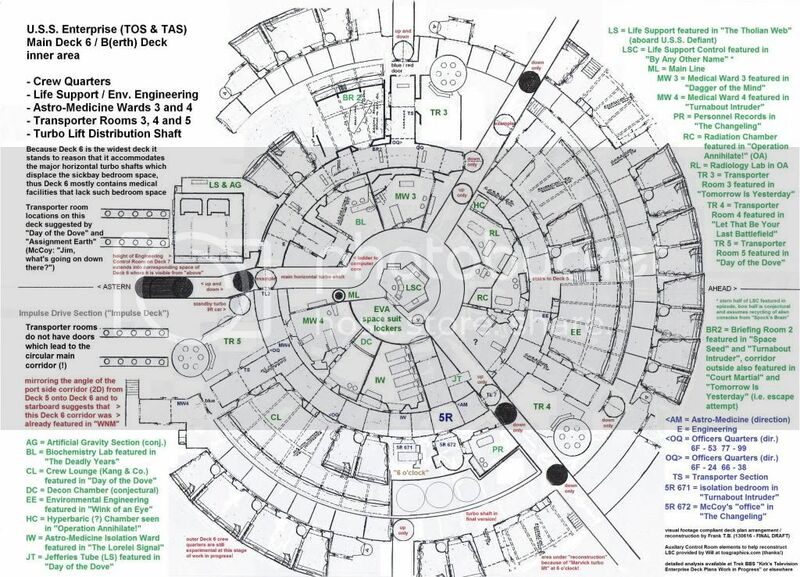 The non-canon K-7 blueprints shown on the Cygnus X-1 site suggest that space station is of a size at least within the same magnitude as the Starship Enterprise. There was never anything official about that, of course. But the Vanguard-type station in "The Ultimate Computer" is intriguing. Anybody care to guess at its size? It is shown with a starship docked to it. I must admit, I've never really looked at that new design of space station before! It is an interesting shape, sort of a precurser to the ST3 mushroom maybe? Anyway, judging by the other starship docked and assuming it is scaled to the "official" length of 947' (230' high) then the space station would be 1,330' tall (not including the spire and dish) and around 1,250' diameter. These are only very rough "eyeballed" figures, of course. The curved wall with recessed shelving (recycled from Pike's cabin in The Cage) is clearly visible, along with a small table and chair - and we know from the previous shot that the side-corridor would pass straight through the whole area! Fortunately the episode never specifies what this area actually is. So, while it may seem to be another bedroom, bathroom or oversized closet (it's a lot deeper than Rand's closet) the geometry of the earlier shot dictates that this must in fact be a stretch of corridor with a rest station opposite Captain Kirk's third door. While a seemingly odd solution, there is at least space to include all the visible elements from both shots. Sorry to go on, but that side-corridor was an unnessary addition to the set IMHO and causes a lot more problems than benefits. I could certainly buy the idea that he was a security specialist (or someone with double training) however. Good catch on the corridor image. I wonder if it's possible that the studio people were trying to pass off the second corridor door as being a direct door to the captain's changing room/head/whatever that Marlena disappeared into. I know, the dimensions probably don't add up, maybe that's what they wanted to suggest. On a neo-Nazi ship like the I.S.S. Enterprise, maybe the captain's second door only opened from the inside, so the captain (or his lover) could scoot out to the corridor if the ship sounded an alert or something like that. I strongly agree that it was meant to represent Lt Moreau's quarters adjacent to Kirk's, or at the very least a walk-in closet / changing room / bathroom (or a combination). However, the final episode is what it is - oiled traps and all! We also get a glimpse of the (still) opened walk-in closet (with a black cube Janice used as a step-up aid?) when Kirk leaves his cabin in the final episode. But what about the roatating cylindrical closet? IIRC, we’ve only seen two thirds of three thirds, i.e. the closed wall and the part with the drawers and the mirror. I’d speculate (“The Conscience of the King” with Spock’s searching notwithstanding) that the third and unseen part could contain a toilet seat. I’d imagine that the crew would like to have some privacy when doing that kind of business (i.e. a toilet for each single cabin or part of it) while the (sonic) showers would be in compartments shared by more than one. This thread brings up an interesting point: Are we really talking about 430 individual cabins with 430 individual toilets and showers? Even Jack-and-Jilling half of those would be a significant reduction of space, weight and engineering. Oh but we do, in "The Tholian Web." Replacing those shelves with another drawers unit would provide storage for two person occupancy. Another thought: Species-specific facilities could be another argument for segregated crews. Ah Terror Grin, you beat me to it about the rarely seen other third of the cylindrical unit! But given the rather impractical design of the unit in the first place, I doubt that there's enough space in there for two people's belongings. Or is there also some hidden "wainscot cabinets" after all, as per Franz Joseph's designs? I'm thinking that most of the crew (and officers) use communal wash areas without a second's thought or bother. Uhura is unusual in that she has her own ensuite, but maybe Robert_Comsol is right and she's somehow managed to wangle her own bath that uses real water, instead of the sonic showers that the rest of the crew have to endure. BTW Bob, thanks for the heads up about the closet door still being open - I've have to dig out my DVD later. So, that makes the closet from the deleted scene canon, then? Doors being left open by the production team happened a few times in the first few episodes - Enemy Within has one example when bleeding Kirk returns to his cabin (it's the door between the cabin and the EEP ladder, if I remember rightly. Trekcore doesn't have the shot). Ah Terror Grin, you beat me to it about the rarely seen other third of the cylindrical unit! But given the rather impractical design of the unit in the first place, I doubt that there's enough space in there for two people's belongings. My point wasn't that it was enough storage, only that you could have the same storage for two people as we are shown being provided for one. And it's usually a given that space-saving designs mean some compromise on functionality. Come to think of it, there may be enough spacing shown to allow for a thin curved door to cover the unit, so there may be a third unseen side. Or that the crew uses diplomatic suites when they are not needed by diplomats. So rather than Uhura nobly volunteering her quarters for use by Elaan, she was forcibly evicted! It's certainly possible, I agree. However, I do like the idea of Uhura sweet talking her way through the technicians and support staff (we saw this in Man Trap) until she has the most fabulous quarters on board! Certainly Kirk and Spock never seem to occupy cabins that would allow room for bathrooms. Spock: The Dolman of Elaas has been given a Class-1 ambassadorial rating by Starfleet. We will need one of our diplomatic cabins. Kirk: Before we bump someone, ask for a volunteer. Nobility restored. In truth, having cabins do this kind of double duty makes more sense to me than the Enterprise warping around with unused space that dedicated diplomatic cabins would represent. Which might raise a question on how to accommodate 100+ passengers in "Journey to Babel." Easy: You leave your exploratory specialists at the nearest Starbase. I too find the idea appealing, and, based on personal experience, in keeping with the "finest" of naval traditions. However, I doubt that Kirk would allow that kind of graft system to operate on his ship. Is this based on the outside corridors? I tend to ignore that as an artifact of it being a TV show with one corridor. The same way I tend to ignore the bridge artifacts like missing, sections, missing steps and missing/movable railings. Regarding Kirk and Spock's bathrooms; it's true that I (along with a few others) do tend to interpret what we see on screen literally. However, I also understand that it's not the only way (IDIC, yay!). Having the top-echelon officers stay in the top cabins does make a lot of sense, as you suggest. However, they were able to accommodate the colonists from This Side Of Paradise which totalled over 500 people so there must be some redundancy on board. Thanks again to Robert_Comsol for drawing my attention to this. And yes, it does look like Rand was standing on a box to reach the top hanger! So in fact it is the Briefing Room doors that some stagehand has left open, not the green middle door as I thought. There were quite a few of these GNDN doors on the corridor set, no doubt added to break up the expanse of grey. However, given that most are blocked by the presence of existing rooms, they come off as little more than very shallow cupboards! Incidentally, there is room for a thin cupboard and Kirk's TCM closet there. Since we never saw how the colonists were housed, I trust they were just provided with collapsible beds in the cargo holds. Personally, I'd favor an interpretation where the top officers normally reside in the superstructure, that is, on Decks 2 and 3, with a single dedicated Guest Suite being kept available on Deck 2 as per "The Enterprise Incident" (and even that perhaps because Kirk humbly leaves his special Ready Room or Executive Office unused). When dozens of diplomats with their retinues come aboard, junior officers are packed with the ratings and senior officers move to junior quarters, so that even Kirk is on Deck 5 for the duration of the mission. Perhaps the ship had several dedicated guest facilities originally, during Pike's command, but then Starfleet doubled the crew and those original facilities became top officer accommodation. No walls were moved, meaning that when needed, the spaces could be reassigned to their former use. In the meantime, though, some doors that originally were very much needed became useless and had to be sealed off, but simply locking them was much cheaper than actually plating them over on both sides.